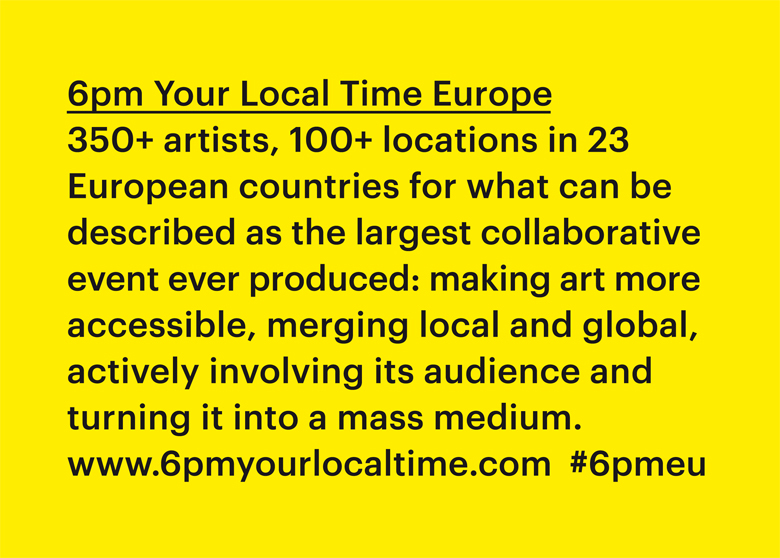 6PM YOUR LOCAL TIME (6PM YLT) is a networked, distributed, one night contemporary art event taking place simultaneously in different locations, coordinated from one central venue and documented online via a web application. After a beta test successfully organized in the United Kingdom in October 2014, the format will show its full potential on July 22, when 100+ participants in 23 European countries and 4 different time zones will open their exhibits at the same time, documenting them in real time on the web platform 6pmyourlocaltime.com, the event’s primary venue. Invited participants and applicants from all over Europe will open together at 6PM (their local time). The events can either be ongoing exhibitions or one night art shows specially organized for this occasion. Participants and their audiences are invited to take pictures and videos, and share them on Twitter and Instagram using the hashtag #6pmeu. The images feed will be transmitted in real time to www.6pmyourlocaltime.com. 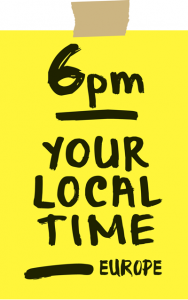 To attend your local 6PM Your Local Time Europe events, check out the participants list on the website www.6pmyourlocaltime.com and look for participants in your city / country. The event can be followed in all its messiness on the website, but you can also consider to make a nice trip to Brescia (I), where it will be streamed – from 6pm to 1am – in real time to the people coming to the Castle for theMusicalZOO festival, which is hosting the event, in a spectacular setup designed by architect Gabriele Falconi. 6pm Your Local Time Europe is also at Expo Milano 2015, hosted byTogether, a festival of events and installations by Sistema Brescia x Expo, taking place from May to October. Along the Decumano, the central street of that extraordinary city called Expo, at Casa Corriere (the main Italian newspaper pavilion), Domenico Quaranta, Link Art Center’s Artistic Director, will present the event at 6.00 PM, showing the live flow of images documenting one of the most exciting cultural events of the summer. The list of confirmed participants currently features 100+ events from 23 European countries. More events are still on the way to be confirmed. The event is curated by Fabio Paris for the Link Art Center, and organized with the help of four amazing collaborators: Chiara Chiarelli, Chiara Rigolli, Linda Rocco and Miriam La Rosa. It’s done in collaboration with Gummy Industries and the festival MusicalZOO, with the support of Comune di Brescia, Fondazione Brescia Musei, Università Cattolica del Sacro Cuore, Fondazione ASM, Brescia and Aksioma, Ljubljana, and kindly sponsored by Pressytal. 6PM Your Local Time is a format by the Link Art Center, developed in collaboration with Abandon Normal Devices (AND), Manchester and Gummy Industries, Brescia. The project is part of Masters & Servers. Networked Culture in the Post-Digital Age, a joint project by Aksioma (SI), Drugo more (HR), Abandon Normal Devices (UK), Link Art Center (IT) and d-i-n-a / The Influencers (ES) that was awarded with a Creative Europe 2014 – 2020 grant. For 24 months from September 2014, Masters & Servers will explore networked culture in the post-digital age.